“Manguri Wiltja”, an interactive play space/installation by FORM in collaboration with Polyglot Theatre and the Tjanpi Desert Weavers, brings experiences of remote community life to city kids. With a focus on the creative and community-building possibilities of collaboration, and a strong commitment towards leaping into the unknown, project curator Andrew Nicholls gave Miranda Johnson some insights into the background of the project and what to expect when the installation is opened to the public at Revealed: WA Aboriginal Art Market, Saturday 13 April. Miranda Johnson: How did the relationship between Polyglot, Tjanpi Desert Weavers and FORM originally come about? Andrew Nicholls: FORM has worked with Tjanpi on numerous exhibition projects over the past two decades we are huge admirers of their work in general, and well-aware of their artistic significance at a national level. Although we had not previously worked with Polyglot, they came to our attention a few years ago when we were looking to incorporate some more children-and-family-focused programming into what we do. It was actually my colleagues Amy Plant and Mollie Hewitt who first came up with the idea of bringing the two organisations together, as they recognised strong aesthetic similarities between the work made by both organisations. The three of us just had a gut feeling that there was the potential there for a really exciting collaboration. I then approached each of the organisations (back in 2016) with an exceedingly vague invitation to collaborate, which was a bit daunting because at that stage we really didn’t have any clear idea what we were pitching! Luckily it turned out that Tjanpi had been thinking about exploring performance for some time and had just been waiting for the right project, and that Polyglot were huge fans of Tjanpi and also had been looking for a project that would allow them to collaborate with Aboriginal artists, so everything just fell into place. There’s been an extraordinary amount of serendipity and good luck as the work has come together over the past three years. Polyglot’s Justin Marshall and Tjanpi artist Dianne Ungukalpi Golding at ‘Manguri Wiltja’ third development workshop in Perth, November 2017. Photo: Bewley Shaylor, courtesy of Tjanpi Desert Weavers, Polyglot Theatre, and FORM. MJ: How were the project’s artists selected? AN: Tjanpi Desert Weavers engage artists from numerous communities spread across hundreds of thousands of kilometres of central Australia, so to make things manageable they suggested we work with four highly respected tjanpi artists from Warakurna, in remote Western Australia: Cynthia Burke, Dianne Ungukalpi Golding, Nancy Nanana Jackson, and Dallas Smythe. Polyglot similarly recommended some of their most innovative performers, Justin Marshall, Justine Warner, and Tamara Rewse, with their phenomenally talented artistic director and co-CEO Sue Giles leading the development workshop sessions. 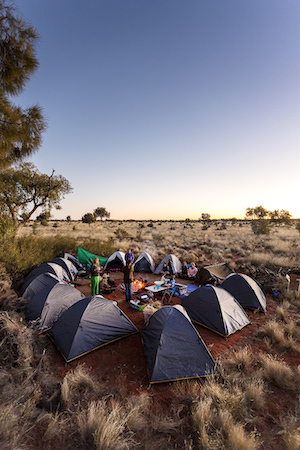 Bush camp as part of ‘Manguri Wiltja’ second development workshop in Warakurna, July 2017. Photo: Bewley Shaylor, courtesy of Tjanpi Desert Weavers, Polyglot Theatre, and FORM. MJ: How has the collaborative process rolled out? AN: We held our first workshop at Polyglot’s premises in Melbourne in November 2016, to get to know each other and throw ideas around. Again, it was quite daunting for everyone because none of us had a clue what we were actually going to do together, or if a collaboration would even be possible. Thankfully everyone very quickly realised that we wanted to work together to make something really special. It has been an absolute joy to develop the work together, and to draw inspiration from such a talented and professional group of creatives. 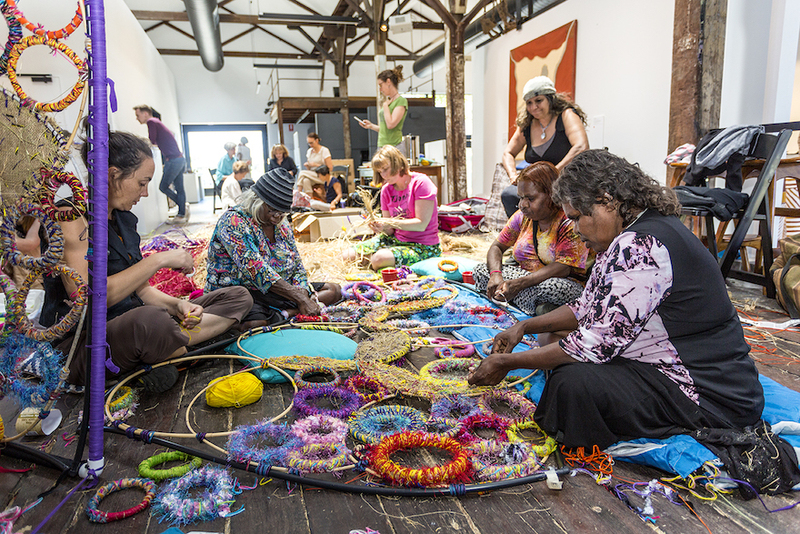 The initial workshop was followed by a trip to Warakurna, where all of the non-Tjanpi artists were introduced to the Tjanpi artists’ Country. This was a transformative experience for everyone involved and allowed the artwork to really start to take shape. Further workshops followed in Perth and then in Warakurna again, and now in Fremantle during the lead-up to Revealed. MJ: What are the similarities and differences that you noticed between each arts organisation’s artistic practices? AN: The project came about because everyone involved recognised similarities between what Tjanpi and Polyglot do. Both organisations make very sophisticated work from simple materials and techniques, and both of them have a joyously playful aesthetic and a highly mischievous sense of humour. In terms of the working methodology, the content of the project was primarily driven by the Tjanpi artists and how they wanted to share a sense of their Country, which was then shaped by the Polyglot team into something that would work as an experience for audiences. Throughout this process, FORM played the role of facilitator. But the joy of tjanpi weaving is that the techniques are so easy to share, so within a couple of hours of meeting everyone at the first workshop in Melbourne we were all making tjanpi creatures that will be travelling across the country to be part of the work in Fremantle. ‘Manguri Wiltja’ third development workshop in Perth, November 2017. Photograph by Bewley Shaylor, courtesy of Tjanpi Desert Weavers, Polyglot Theatre, and FORM. In terms of differences, Polyglot allows everything they do to be driven by input from children – kids are involved wherever possible throughout the development of their projects. This isn’t necessarily how the Tjanpi artists work, but children are always a strong presence in remote community life, so this felt like a very natural thing to incorporate into the process, and we worked with children in each of the workshop locations. 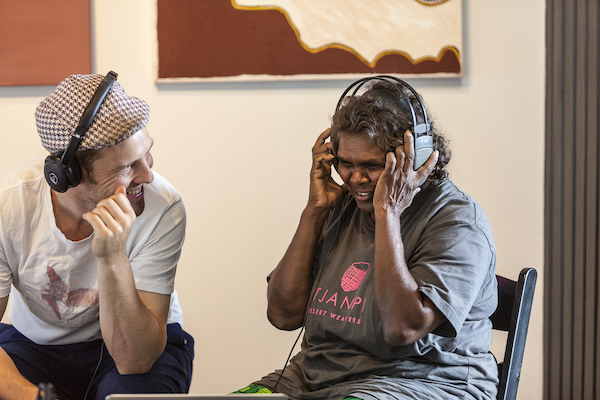 The Tjanpi artists meanwhile are primarily inspired by culture and their connection to Country, and everyone got a taste of this in Warakurna. While non-Indigenous visitors to Warakurna are never going to have a comprehensive understanding of what this means, the creative team were given an extremely warm and generous introduction that really crystallised the project for everyone involved. Manguri Wiltja third development workshop in Perth, November 2017. Photograph by Bewley Shaylor, courtesy of Tjanpi Desert Weavers, Polyglot Theatre, and FORM. MJ: Can you tell me more about the interactive nature of the installation? 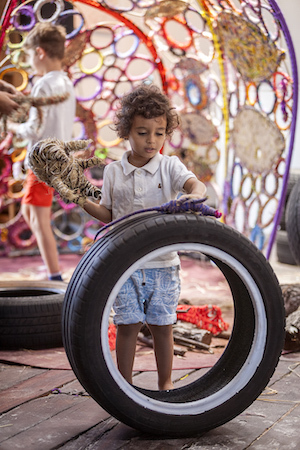 AN: The installation is a space for children to explore at their own pace. The artists will all be present to guide this, but as with most of Polyglot’s work it is the participating children who will take control. 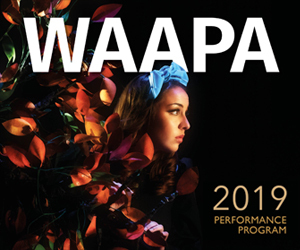 They will get to climb over and explore the installation, discover tjanpi creatures hidden throughout the space, listen to the sounds of Warakurna, and sit inside the wiltja (a traditional shade structure) and learn how to create a tjanpi object of their own. We have tried to make it a work that children of almost any age, and all levels of physical ability, will be able to enjoy. AN: Something that I think resonates with everyone who learns tjanpi weaving technique is how incredibly meditative and soothing it is to do – spending an hour or two in the company of those artists, hand-making something and sharing conversation simply makes you feel fantastic. I think the technique itself is a “safe space” and the wiltja was an organic extension of this. As an object in its own right it’s very clearly hand-made and it’s something you can sit inside, so it has a very cosy feel. Everyone involved in “Manguri Wiltja” has had nothing but respect toward everyone else for the duration of the project, and this trust was able to build up over a solid length of time, which has given us all the confidence to work at our best and take a few creative risks with each other. That’s an incredibly rewarding space to be in as a creative. Ten days out from the world premiere we still don’t entirely know exactly what the experience of the final work will be, but we trust each other enough to know it’s going to be marvellous. MJ: Do you see collaboration as central to cross-cultural learning and communication? Do you think this is something that would be beneficial to adults as well as children? AN: Absolutely. At FORM we always strive to try to achieve a level of collaboration in most projects we undertake with artists – we are passionate about placing artists in conversation with Western Australian communities and seeing what can happen as a result. However, co-creation is not something you can force. Sometimes it works and sometimes it doesn’t. The great joy of “Manguri Wiltja” is how the various collaborators “clicked” almost immediately on our first day together in Melbourne. Given how vague the parameters of the project were to everyone initially, and how disparate the various creative practices and cultural influences were, it could easily have gone the other way. We have always intended for “Manguri Wiltja” to be a work that children can experience with their parents (or other relatives) so we absolutely want people of all ages to share in the joyous spirit of the project and learn some more about life in remote Australia. “Manguri Wiltja” will be at Fremantle Arts Centre, as part of “Revealed”, Saturday 13 April, 10-12pm and 2-4pm. Entry is free. Pictured top: “Manguri Wiltja” third development workshop in Perth, November 2017. Photo: Bewley Shaylor, courtesy of Tjanpi Desert Weavers, Polyglot Theatre, and FORM.